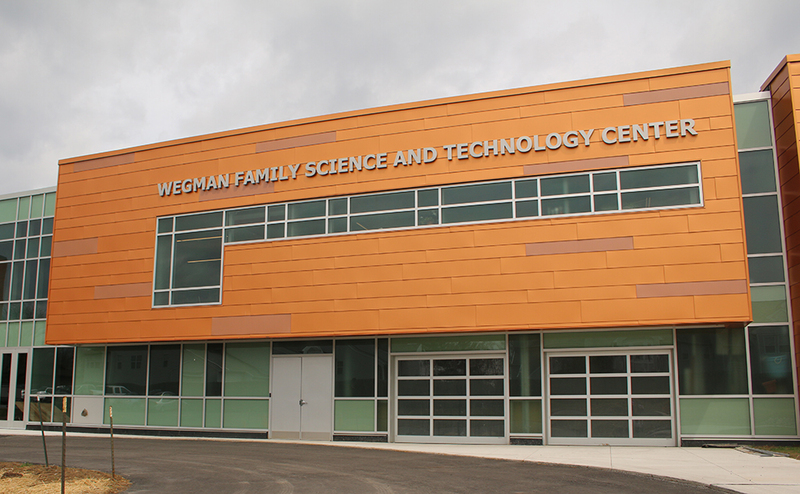 The Wegman Family Science and Technology Center is truly unique, the only school facility of its kind in upstate New York and beyond. The facility boasts seven science laboratories, included in which is a two story signature robotics lab, faculty offices, and four computer laboratories. In addition, and consistent with the school’s holistic educational vision, the Wegman Center also features a student life area complete with an outdoor student commons, a campus ministry suite, and formal and informal spaces for collaborative student learning. The building’s atrium cascades sunlight throughout, inspiring creativity among McQuaid students. The design of the building is distinctive. Developed by Rochester-based SWBR Architects, the Wegman Center communicates dynamism and fosters enthusiasm for student interactive learning. “The metal panels and glass clad addition uses color and scale to blend into the campus while simultaneously displaying a sleek, angular, and thoroughly modern design befitting the progressive program it contains.” (SWBR Website) In the words of Danny Wegman, ’65, the building design truly “inspires” McQuaid men as they pursue the goals of a Jesuit education. The dream for the Wegman Center emerged out of the school’s strategic planning effort of 2013, which called for a comprehensive assessment of the school’s academic curriculum and the related school facility that supports it. With the facility plan in place in early 2014, the design for the Wegman Center was soon completed. Through the tremendous generosity of McQuaid Jesuit alumni, parents, and friends, and the efforts of the “IgKnight the Future Fund” groundbreaking and construction on the 36,00-square-foot, $16 million project began in summer 2016. With our partners at DiMarco Construction leading the charge, the school community celebrated the building’s dedication November 1, 2017, with students beginning classes in the Wegman Center in January 2018. We have state-of-the-art laboratories, classrooms, collaborative spaces, and our brand new campus ministry center, which coordinates programming for our students to learn about social justice, to learn about service, to, to find meaning in relationships with other people, and specifically by serving with and alongside other people. It’s all of a piece of, of forming the whole person here at McQuaid. In addition to student classes and collaborative learning, the Wegman Center also serves the interests of the larger McQuaid and Rochester communities. Since it opened to student use in January 2018, the school has hosted various robotics and engineering events, student art shows, and a variety of social gatherings. In spring 2018, McQuaid was proud to team up with RIT’s MAGIC Center to host a professional development day for science faculties of local Catholic grammar schools. We look forward to annual fall events such as the “Let’s Solve Water” challenge, sponsored by Xylem, and our Middle School LEGO competition, sponsored by the University of Rochester. For more information or to schedule a tour, please contact Tim Nally, ’67, P ’98, ’02, ’06, at 585-256-6101. According to niche.com, McQuaid Jesuit ranks in the top 18 percent of best United States high schools for STEM (Science, Technology, Engineering, Math) education.